Where the dungeon ends, another adventure begins! 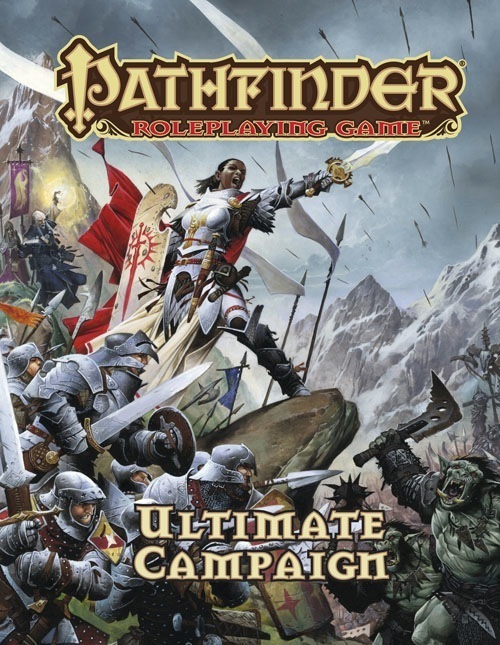 Pathfinder Roleplaying Game: Ultimate Campaign takes you on a guided tour through the parts of the game that happen between monster attacks and quests for ancient artifacts. As some of the most powerful and prestigious heroes around, do your player characters want to build up a kingdom of their own, or lead an army against a neighboring nation? Perhaps they want to start a business, craft magic items, or embark on a quest that will come to define them. Whether you're looking for help generating a young character or seeking ways to challenge adventurers who've grown bored of fighting monsters one-on-one, this book has everything you need! My first impressions of Ultimate Campaign were pretty positive, and now that I've had time to read through the whole thing, I can honestly say that this is a must-have for any campaign that goes beyond the scope of the dungeon crawl. If you're looking for guidelines and rules for all the things that happen outside the dungeon itself, this book is an incredible buy. 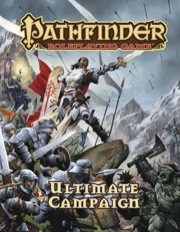 Basics- Ultimate Campaign focuses on the rules around the rest of the Pathfinder RPG. This book is more "meta" then most books. The book starts with a chapter on how to make characters; not how to make stats, but how to build a story into your characters. Next the book gives a chapter on what you can do in your down time with ideas ranging from building businesses to creating organizations. After that is a chapter on different rules systems covering ideas such as bargaining to taxation in your game. The final chapter is how to build a kingdom and mass combat. After thumbing through the book I decided to pick it up. I think the systems in the book are really interesting and I'm actually adapting them to my 4e game. The book is chock full of fluffy stuff but stuff tied with mechanics so as a DM you get an idea of what type of rewards to apply to a player when they have a background or have own a business. The mass combat section is pretty neat as well, and with a little tweaking I can adapt that as well. This is a pretty decent fluff book. However, I wish the price was $29.99 instead. The paper quality used is substantially weaker than previous books. There are useful things to be found within for the GM who is not too busy to come up with himself or herself but nothing is overwhelming in here. Reminds me of the numerous volumes Wotc produced for 4E. This is definitely a homerun for Paizo. This is definitely one of their best products they have put out in a while. I actually gave it 4.5 out of 5 stars, but it is still good enough to give it 5 here. Read my complete review HERE at Skyland Games. Up for preorder! Cover image is a mockup and will change. Will PDF version be available later? Yes, but not for a while yet. Edit: And hey, lookit that, FINAL COVER UP! Nice Leadership score there, Seelah! Wow final cover surprise! LOVE it. Mass Combat Rules? Sign me up. And finally collecting the various optional rulesets from APs like Jade Regent and Kingmaker? Sounds fun. And the Fame rules, are they taken wholesale from PFS? Or are they new? April? Seriously? I want it NOW! This book doesn't seem to be linked in properly to the Pathfinder Role Playing Games Products page. It's not listed I mean. *drool* Do want... Oh! And just in time for my birthday. I'm curious about the kingdom building rules. Specifically, if the kingdom rules are an expanded version of the Kingmaker ones and if so, will any new expanded material be easy to intergrate into an existing Kingmaker campaign like what Jon Brazer Enterprises did with their excellent "Player's Guide to the River Kingdoms" book. More additional material for Kingmaker is always appreciated. Wow so fast I didn't even get to see the mock up art for the cover. This sounds interesting, might have to renew my subscription. What sort of scale will the wargaming rules be? I'm not so much on the tactical minatures games, what I'd really like to see is either something like BECMI's fairly large-scale strategy rules or the board game that was one of the original Dragonlance modules that let you track the course of a war across the entire continent month by month. This is stunningly shiny! April seems so far away! I like the premise and it seems like the perfect toolkit for the kind of campaigns I like to run. I'll be curious to see whether it connects with the Mythic rules at all. Jason? Anyone? Yay! It's new solicitations day! That might be the best Seelah art yet. Oh, and the book looks good too. The Kingdom Building rules are indeed the ones we used for Kingmaker. Expanded and revised, with all the player feedback from Kingmaker taken into account. Same goes for the mass combat system, which ALSO debuted in Kingmaker. Other rules will be picked up from other things we've tried out in the Adventure Paths now and then, or elsewhere. Nah, the Crown of the World piece still takes top spot in my book but this is one the coolest covers in the RPG line so far for sure. And hey, lookit that, FINAL COVER UP! This is really a GREAT cover!! Any chance we will see the artwork clean and pure on the Paizo Blog? Anyway: You did it again Mr. Reynolds!! MOST AWESOME COVER EVER. EVER. I gotta admit, I wasn't going to just post on the cover alone, but it is amazing. I love it. I am curious how well UC will play with the Status rules from the Midgard CS. This is indeed a fantastic cover. Well done, Wayne! It is a great cover. Except...why is an orc using a dogslicer? And I am so delighted to hear about rules for what PCs are doing between adventures, owning businesses (hey, why can't adventurers buy an interest in inns and taverns? They spend so much time there, they might as well be getting some gold back from the place), and especially on building and ruling kingdoms and on mass combat. But man will it be hard to wait until April for this! Looks like I am going to have to place a second and third mortgage on my house! Who needs a house? Just ask that it gets sent in a very large box. Indeed, I think it would work out nice. And if not, a Midgard supplement might be able to bridge any gaps. This book looks like another "must have." I notice that the book description indicates this book is going to have rules for fame. Are these the same fame and prestige rules from Pathfinder Society? Will this book become part of the core assumption then? Just a page or two with something official regarding the mention of the basic mechanics of using a tape measure, etc., for movement, units... I intend to use the rules in the book and bring it to the terrain board! This of course, isn't mandatory, but something in print officially regarding terrain minus the grid square or hex would be most welcoming. And, I think would tie in with the overall theme the book represents. Along with a can of Scotchguard! From everything we've heard about this book, it's not going to include stuff for actual dungeon delving. It's going to cover the rest. Personally, this looks like an indispensible book. Color me jazzed. Go Paizo go! Professionally, this definitely looks like the sort of book we at Fire Mountain Games want to support. So, I'm definitely interested. This goes on my list. One question, though (not that it will affect my getting it,I'm just curious). While it looks like it includes all the various subsystems you've used so far, I don't see a refence to the caravan rules. Will you be updatig and including those as well? Sounds like another player guide - focusing on world/mechanical subsystems vs. actually helping the DM develop his campaign (besides the one NPC creation blurb). I think I'll pass on this one till I know more - so far it looks like the GMG 2 for players.